The Hispanic Association of Colleges and Universities and the Ford Motor Company Fund have extended the deadline for the “Ford College Community Challenge” grant designed for students at HACU-member Hispanic-Serving Institutions to collaborate with a non-profit on a proposal to help address a local need to make people’s lives better. Online proposals will be accepted until April 15, 2019. 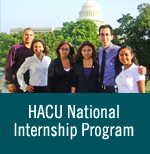 HACU will offer a free webinar for college students, faculty, and nonprofit staff members on “How to apply for the Ford C3 Grant/Team Scholarships.” HACU staff members, Gaston Cantu, director of student services, and Mario Gonzalez, associate director of student services will discuss the application process and will go over sample proposals. This webinar will take place on March 19, 2019, from 1:00 – 2:00 p.m. CST | Register here. Proposals accepted may range from education and community development to safe driving. The Ford C3 grant requires student teams to partner with a community-based 501c3 organization to develop a proposal for a chance to receive implementation funds. A project budget and an awareness campaign will be required with the proposal. For complete entry details, Ford C3 project criteria, timeline, click here. Online applications will be accepted through April 15, 2019.